The feast of the Immaculate Conception is on Dec. 8th - nine months before Our Lady's Birthday (Sept 8th). 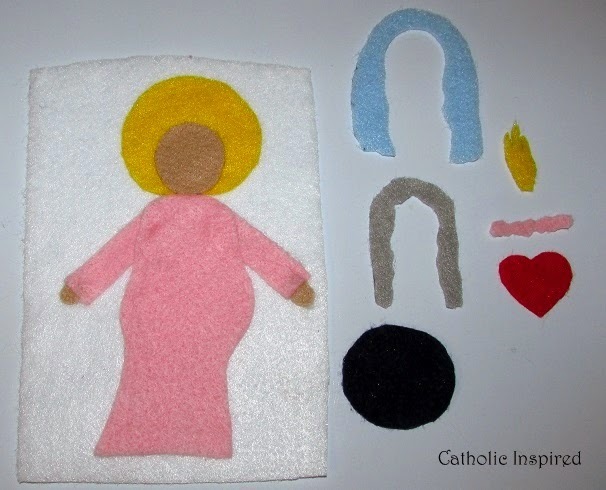 This is a celebration of the day God created Mary's Immaculate Soul! 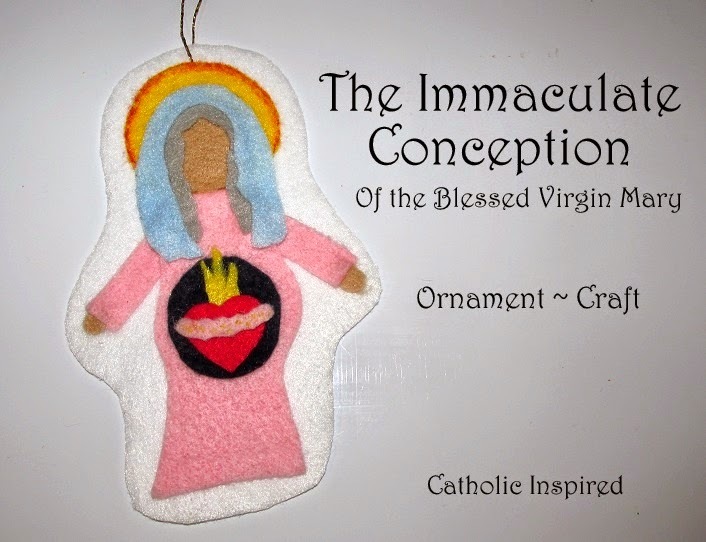 Our Lady of Lourdes introduced herself to Bernadette as "The Immaculate Conception", but what does "The Immaculate Conception" mean? 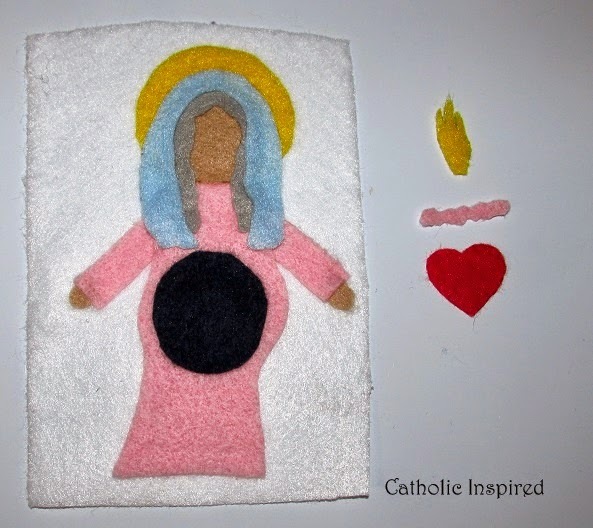 It means that Mary NEVER had a sin on her soul. 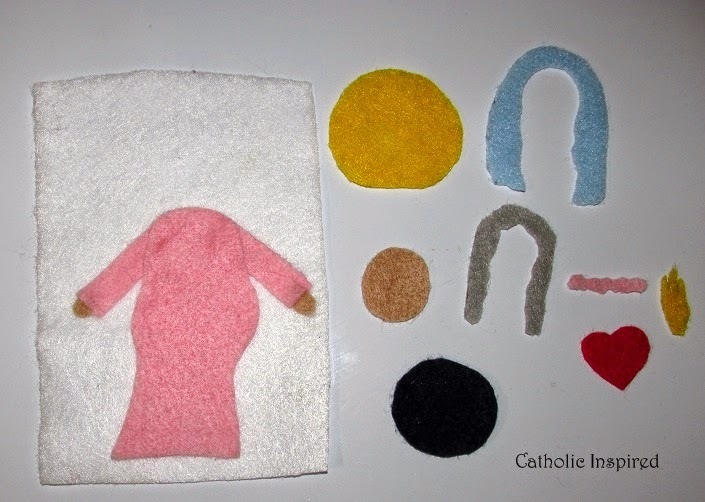 It means that when St. Anne conceived Mary, she was created without the stain of original sin on her soul. God prepared Mary's soul to be worthy of being the Mother of God. Mary, the Immaculate Conception, is often called the "New Eve", because she was created without sin just as Eve was. But unlike Eve, Mary was willing to follow and trust God throughout her life. Sadly, Eve choose to sin later in life. Because Mary chose to never sin, Jesus was able to be born and later died to save us from our sins! Because "The Immaculate Conception" chose to remain sinless and because she said "Yes" to God, we are all able to enter heaven! 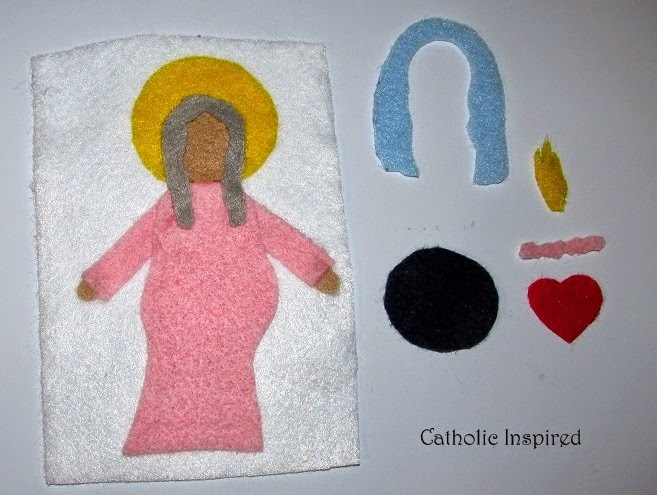 Here is a liturgical ornament for the feast of the Immaculate Conception. It depicts St. Anne pregnant with Mary. 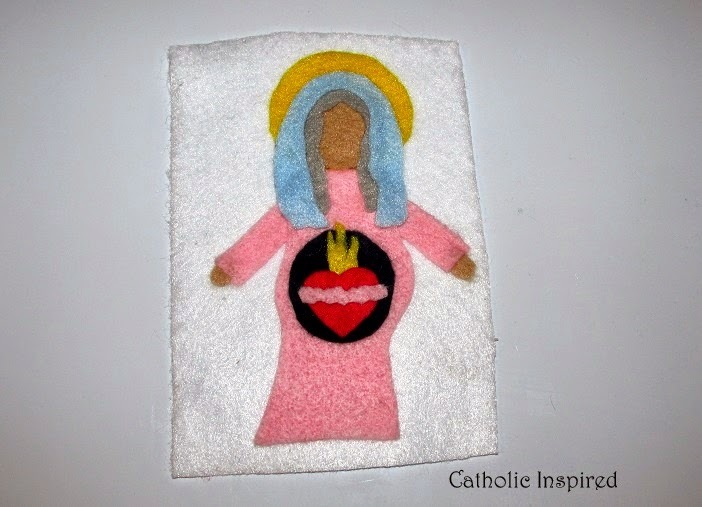 Mary is symbolized through her Immaculate Heart. First, cut out the parts like those above. You can add the orange marker outline to the halo now if you wish. Note: St. Anne's hands are missing from the above picture. Glue down St. Anne's body. Don't glue the top part of her body till you have added her arms in the proper spot. Glue down the arms and then finish gluing the upper part of her body. Add her hands to the arms. Now add her halo and then her head. Next add her gray hair. Now, add her "belly" and veil. 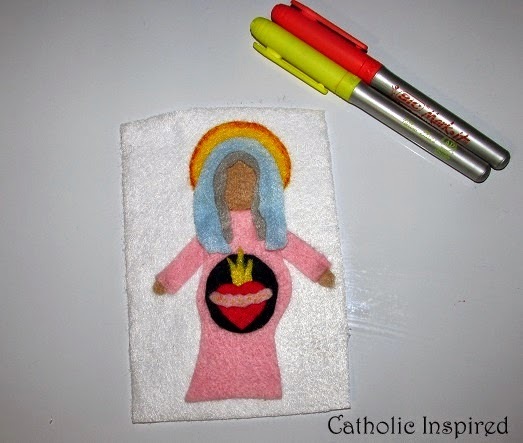 Now, add the Immaculate Heart of Mary to her belly. If you haven't already added the marked parts, do that now. Add orange to the halo. We also added a few yellow dots to the flowers on the Immaculate Heart. These are hard to see in the picture, and this step is not necessary. Finally, cut off the extra background and add the threaded loop to the top so it can be hung up. May God bless you all with His joy. Hello, I love this and hope you don't mind that I shared the link to your page on a Facebook page that I manage. It is called In Honor of Mary, Our Mother. Thank you! 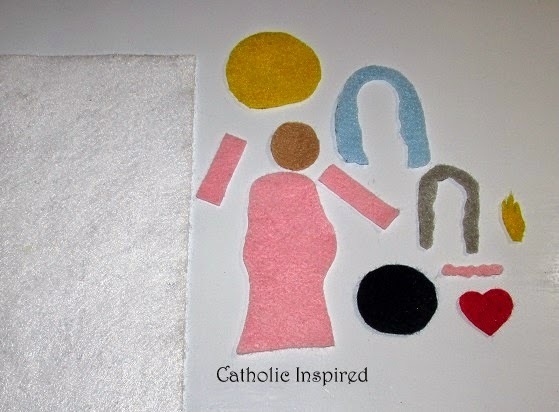 I will be looking forward to making this with my daughter. Hi Michele, Please feel free to share this link. I hope you and your daughter enjoy! Do you have a template for this or did you just wing it? Thanks!